While in Japan recently I was really inspired by the concept of the beauty alcoves that I saw everywhere we went, styled corners consisting of drawers or shelves where people displayed their favourite collections and items. I think traditional Japanese houses have always had them for displaying art (called Tokonoma) but what I saw was mostly a little more modern and spontaneous than those. The Airbnb we stayed in had one. The doctor’s surgery we visited had one (his was a collection of porcelain owls… random but very cute). And the Ryokan we visited had one in the corner. I loved that it shows a pride in your space and a touch of sentimentality, as well as an admirable ability to keep that area tidy! After I finished (somewhat) with all the DIY projects at the studio (including this ladder wardrobe), I started thinking about how I could update our apartment, and integrate the concept of the beauty alcove – specifically as a place to put all the things I collected on my travels. I decided to create a set of ladder shelves for this purpose, they cost about $10 to make and packed such a punch in our small (v v small) space! For the pine wood planks, cut to incremental sizes, I went for two at 1.2m (48 inches), then 1m (40 inches), 80cm (30 inches) and 60cm (23 inches) for the top. Stand your ladder up where you want it to sit in your house. It's easier to be sure of the location before you build it. Slide all the pine planks onto the cross beams of the ladder, making sure to stagger the size as you go up. Press the L-brackets up against the ladder cross beam and the plank. 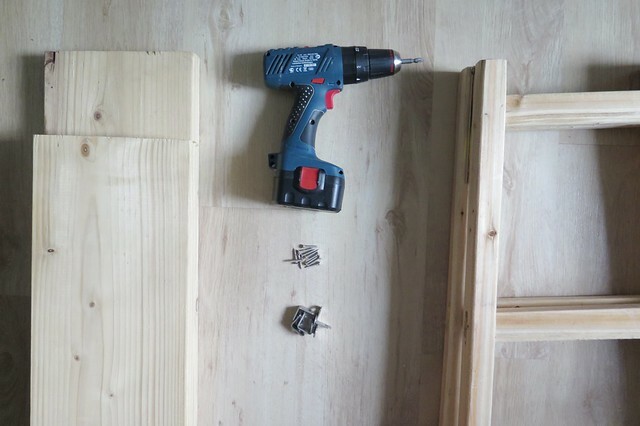 Use your drill to secure the L-brackets. Dreaming of all the other things I can make out of these ladders… thoughts?